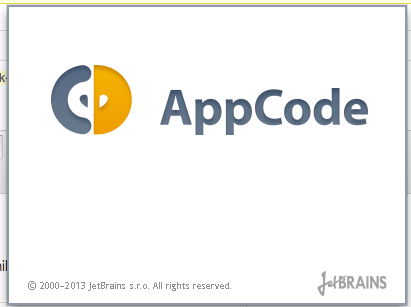 JetBrains recently released version 2.0 of their fantastic Objective-C IDE, AppCode. If you aren’t using it, you should go grab a copy – you won’t regret it. Let’s have a quick look at some of the cool new stuff, and how it compares to AppCode 1.x as well as Xcode. Let’s get to know AppCode! It’s a little bit slow to launch, but Xcode itself is no speed demon here, so it’s hard to fault AppCode too much. Unfortunately, opening a project for the first time still takes a while, thanks to the index building process. Fortunately, the index building process only seems to happen once per project. Subsequent opens only take a few seconds of ‘Reading Index’. Additionally, there’s no longer a long delay when switching between configurations (iPhone simulator to iOS Device, for example). Thanks, JetBrains! That was a pretty big annoyance. 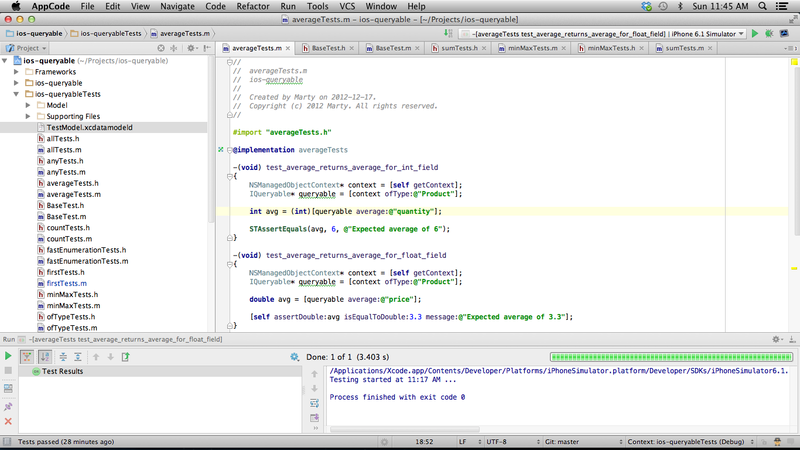 AppCode looks a bit different than your typical Mac app. This is understandable, as it’s built on JetBrains’ cross-platform IDE framework – the same Java-based framework that powers products like IntelliJ IDEA and RubyMine. Version 2.0 adds an attractive new dark theme. It’s easy on the eyes, but it’s even more of a contrast from the rest of your system. One of the best things about AppCode is it’s keyboard shortcut support. It includes a built-in Visual Studio keybinding scheme. If you are a developer coming from the Windows world, a nearly-complete set of Visual Studio keybindings is almost worth the price of admission by itself. In addition, AppCode supports chorded hotkeys – hotkeys with multiple steps. Instead of having to use hand-contorting shortcuts like Cmd-Shift-Option-Space-R-7, you can use much nicer multi-step hotkeys like Ctrl-R, Ctrl-V to launch the Extract Variable refactoring. You also get a few other niceties like proper (from a Visual Studio perspective) Ctrl-Tab document switching. When you run unit tests in Xcode (and by run unit tests, I mean run all the unit tests in your project, because that’s about all Xcode lets you do by default), an instance of the iOS Simulator gets launched, and your tests are run inside of it. Want to run something other than all the tests in your project? You can either create separate targets for each set of tests you want to run, or find a third party test runner. When you run unit tests (or a single test, or a file’s worth of tests – it’s nice to have options!) in AppCode, the simulator isn’t used at all. Whatever AppCode is doing, it’s doing it a whole lot more efficiently than Xcode. Here’s a quick look at some of the refactorings offered by Xcode. … and here’s what AppCode has to offer. Quite a difference. I won’t go into the details of all the different refactorings here, but suffice it to say, if you want to do any serious refactoring you should be using AppCode. 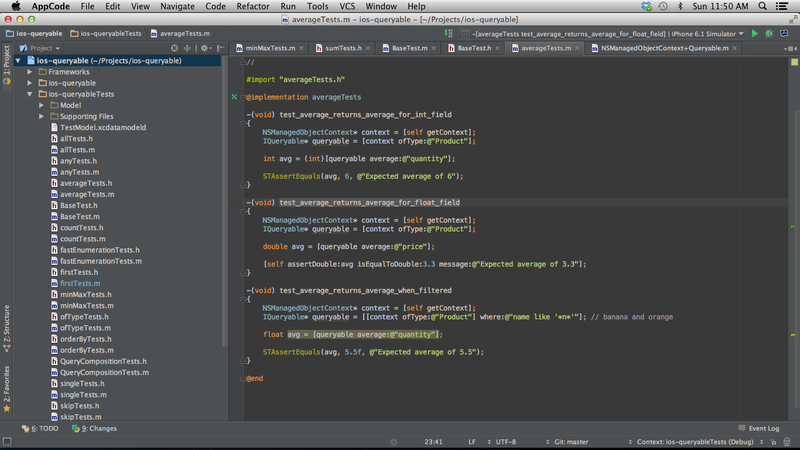 In general, AppCode 2.0 is a fantastic IDE. However, there are a couple of important functionality gaps to be aware of. AppCode does not include a UI designer or storyboard editor. If you try to open up a storyboard in AppCode, it will be launched in Xcode instead. Likewise, AppCode does not include a Core Data model editor, and opening an xcdatamodel will also launch it in Xcode. AppCode also doesn’t have the ability to submit apps to the App Store. Given the secure, proprietary nature of the App Store submission process, I’m not holding my breath for this feature to appear anytime soon. On the bright side, the integration between the two IDEs is fairly seamless, and changes made in Xcode are picked up right away in AppCode. I look forward to the day that I no longer have to launch Xcode at all (aside from app submission), but until then, the AppCode/Xcode combo works pretty well. AppCode 2.0 is a great update to an already great product. If you aren’t already using it, you should definitely give it a shot. The raw editing, navigation, and refactoring capabilities are almost guaranteed to increase your productivity, especially if you aren’t a heavy user of storyboards or Core Data. I honestly wish I had started using AppCode a long time ago; I would probably have a few more apps in the App Store by now. It’s a particularly fantastic tool for UI-less libraries like ios-queryable. As you can tell, I’m a huge fan of AppCode. But what do you think? Are you more productive in Xcode? Another day, another bizzare Xcode error. Right, no problem then! I’ll just switch to iOS 5 instead. And… same error. Ok, how about a clean and rebuild? Same error. Restart Xcode? Same error. ~/Library/Developer/Xcode/DerivedData directory for my project. 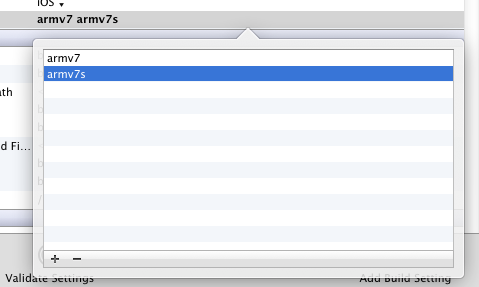 It turns out that Xcode 4.5 adds support for the armv7s architecture, as opposed to the standard armv7 architecture. If you are using a library that has not been compiled for armv7s, and your project is set to armv7s, you will get the above error. In my case, it’s the Core Plot library that is throwing the error. Fixing the problem is simple. You just need to remove armv7s from the list of valid architectures. -Find the ‘Valid Architectures’ setting. It should say armv7 armv7s. -Double-click on it to edit it, select armv7s, and press the – button. And that’s it! Your code will now compile correctly.